Following up on Tuesday’s bomb threat at Claxton Elementary School, the Anderson County Sheriff’s Department said Thursday that a juvenile suspect had been identified, and that suspect had confessed. 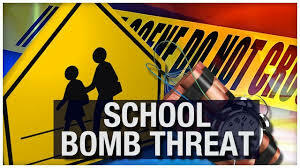 At around noon Tuesday, Anderson County deputies were called to Claxton Elementary School after a bomb threat was discovered by school employees. All students and staff were taken to the nearby Zion Baptist Church while both Anderson and Knox County deputies–which brought in a bomb-sniffing K-9–searched the building. No explosive devices were found. In a Thursday press release, Sheriff Russell Barker says that detectives immediately began investigating, very quickly identifying and questioning a juvenile suspect. The suspect, whose name, age and gender are not being released due to the fact that they are a juvenile, confessed to having made the threat. School returned to its normal schedule on Thursday.